Jay Lancaster grew up in Sequim, Washington on a Guernsey dairy farm. 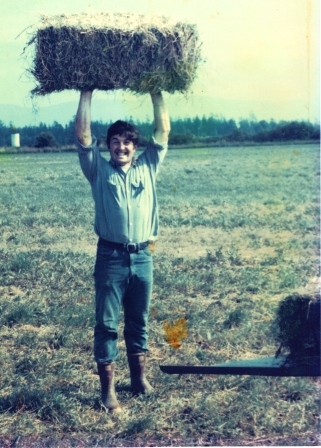 His father Les Lancaster moved to Sequim in the 1940’s to work for the Reed family and manage Graysmarsh dairy, home to a 100 cow registered Guernsey herd. Their father’s motto was “Less Said, Best Said.” Jay and his siblings showed Guernseys at local fairs and helped with all the day to day farm chores, including the movement of irrigation pipeline and bringing in the hay crops. Jay remembers tales of the early days, when cows were shipped in boxcar throughout the Pacific Northwest for shows. 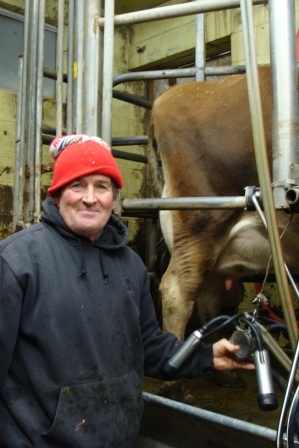 At age 13, Jay took over the daily milking responsibilities, and he has been milking cows ever since! While at W.S.U. on the College Senior Dairy Judging Team, Jay’s team won the Portland International Livestock Dairy Judging contest. The next year, Jay was 9th individual overall and high individual in Holsteins at the National Collegiate Judging Contest in Columbus, Ohio. The team (including Jay and his first wife, Diane) was high in Jerseys and third overall. Jay graduated from Washington State University with a B.S. Animal Science, emphasis Dairy Production. After college, Jay headed back to Graysmarsh to run the dairy and taught Agricultural Education at the high school for a couple years before deciding he wanted to be on the farm full time. Jay upgraded the facility and the cow herd. In this time period, he started judging fitting and showing and conformation classes at many local and county fairs and youth shows. He attributes a lot of his early success to the support and help of his mother, Joan. In 1977, the Lancasters bought property in Ferndale, Washington and custom designed a new dairy facility to house his herd, from day old calves to dry cows all under one roof. 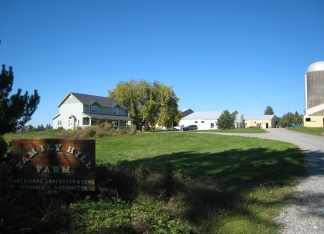 He named the farm “Family Hill Farm” and family operates the dairy to this day. Gradually, the farm transitioned to Jersey cattle, finding them much heartier than the Guernsey breed in many respects. By the early 90′s, the herd was completely Jersey. Diane passed away from cancer in 2004. Jay continues to enjoy judging dairy shows – including: Silvana, Grant County, NW Washington, and Western Idaho (Boise) Fair. Judging a class of adults – prior 4-Hers! Michelle Lancaster grew up on a small farm in N.E. Washington state, learning about animals and the land from her family. She showed animals (pigs, dogs, chickens, turkeys, etc.) in 4-H & FFA for 9 years, earning the Herdsmaship Trophy in her 8th year. In her first year at college, Michelle missed farm life and hired on to milk cows on a dairy – Jay’s dairy! They milked cows every evening and joked about earning a “Bachelor’s in Dairy Science” rather than the History degree she was working on. Michelle learned first about cheesemaking from a neighbor cheesemaker (Pleasant Valley). Next, Mother Therese of Shaw Island, who operates a raw milk dairy and bought their Jersey cows from Family Hill Farm for many years, taught Michelle how to make Mozzarella cheese. Michelle graduated from the WSU cheesemaking shortcourse in 2008. After marrying, Michelle and Jay worked together on a new herd of cows – specifically looking for “family cow” traits. They named the herd: Spirited Rose Jerseys after the foundation cow, a “spirited” cow named Proud Rose and her “queen of cream” daughter Rosebud. From 2009-2012, Jay and Michelle lived in Maryland – Jay working with family & Michelle working for Chapel’s Country Creamery in Maryland making blue cheese, feta, and a line of yogurts. Michelle graduated from University of Maryland U.C. in (BS) Environmental Management. 2012 – The Lancaster family moo-ved home to Washington. Today, Jay & Michelle live in N.E. 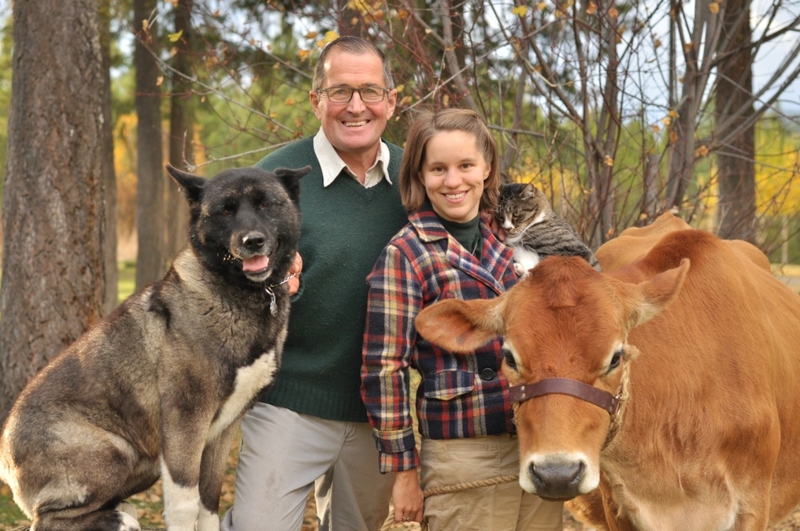 Washington State near family on a small homestead with 2 milk cows, calves, Border Leicester sheep, chickens, cats, and the Akita dog that greets all – Kit. When they’re not at home working, Jay umpires softball & substitute teaches while Michelle works at a local grocery store as their ice cream maker. In their spare time they love to visit with people/have visitors over, attend their local church, and have fun with their farm products. Always looking to learn something new and practice what they know! I visit Sequim on Ma 14th, not realizing how far away you live from Graysmarsh. sense of the life you have lived. Les would be proud! Hal Wilde from 53 years ago. Hello 🙂 Ive really enjoyed your website reguarding choosing sires, a.i. etc. Our Jersey cow just gave us a bull and now we look to two picks for A.I. this and the following year after pouring over every proven ai sire online. We are excited to see what she gives us next year. My daughter was showing in 4H the last two years at Grays Harbor County Fair. This next year she’s switching to open class for dairy as is my younger son. Jerseys have really entered our hearts. It’s been a great experience raising this cow from the young heifer stage who will be 3 next year. If you are down this way next August please let us know. We’d love to meet you in person. Have you picked out a AI bull yet? Curious to hear what you decide on. I would like to buy a dairy calf for the first time and I was wondering if there were any good sellers you could recommend? This show blanket was given to me, it is not one I designed. I posted this information publicly so feel free to use the measurements! If you are making them for sale, I would appreciate a link to our website being posted somewhere. As far as using our photos, could you please send me by email (spirited.rose@yahoo.com) a copy of what you are thinking? Hello, I have just come across your site and I really like it. My family and I are wanting to get a mini jersy cow for milk and we are currently looking into getting a fence put up. I would like any info that you can give me, as we have never had a cow before …. Maybe an email or a few links that can help us get started. We are thinking that one acre of pasture will be okay for a small cow, although I am not sure about feeding with hay and grains. Such a wonderful, informative site! I very much appreciate all the knowledge you have shared. I do have additional questions, however and hoped you might elaborate on them. Our first jersey is about to calve (delivery imminent), and we would like to let her calf as well as others I will be purchasing, to nurse directly from her until weaning. When using this method should I allow for more frequent nursings in the beginning to ensure adequate colostrum intake? And while her baby is nursing (before I gotten any other calves), I’d like to milk some of the colostrum and freeze it. Taking 2 quarts for this purpose will not affect the calf? Is 2 quarts of colostrum the maximum you would take to freeze? I am assuming the other calves I will be purchasing will be a bit older and have already had their colostrum intake. Regarding the scoring of the cows. I was unclear as to when these traits were to be measured. For example, our cow has an ENORMOUS udder at this time pending her first delivery. How might that affect her scores? If I’d like to collect official data on the scoring of my cow, who do I contact for this purpose? Or must the cow be shown to have official scores recorded? She comes from registered stock, but I do not have papers on her. Is that a problem? I hope you will be able to point me in the right direction or answer my questions outright. Thank you so very much for your informative article. I appreciate it very much. If you want to know about share-milking, I suggest you try: familycow.proboards.com The Family Cow Forum has a lot of information on share milking and I am not qualified to answer your questions regarding that, as we only let the beef cows keep their calves. Colostrum intake depends on 1. How much is the calf drinking? (We always recommend milking out one bottle full and directly feeding the calf after birth. This ensures the calf gets colostrum asap and then gives them time to find the udder on their own without worrying about how much colostrum they get. Calves die if they do not get colostrum. You should be fine taking 2qt. after the calf has nursed, unless the cow doesn’t have it to give. If you want your cows scored and they are registered Jerseys, you can go to: usjersey.com and click on “appraisal schedule” to see when they will next be in your area. Your request to be added to the schedule must be in a month prior to the month of scheduled appraisals for your state. And of course, your animals must be registered with AJCA. Our 4-H leader Tom Freeman suggested to us that your family might know where to buy some Guernsey heifers, if not we are also interested in your Jerseys, my kids are in need of Heifers born this month for next years fair. We bought Spirited Rose Comerica Revely last year, and she has been wonderful. She performed well at our local fair, and we are now interested in breeding her. I want advice from you with your knowlege of genetics and bloodlines, so we can arrange for breeding this Spring if you are willing. I have photo’s that you may enjoy too! Hope that you are enjoying being “back home”. I will email you, and hopefully it goes through… So you can email pictures. Hello, I was shocked to see that the dam of your foundation Jersey cow had Barbros in her name. My very first Jersey was a cull from Barbros Jerseys, and I still get a bit choked up thinking about that sweet old cow. No other has quite lived up to her memory. Michelle, could you help me with something? I started a blog for our cows, but I cant figure out how to do anything.